Computational fluid dynamic algorithms use a grid of small volume elements in which the average values of flow quantities are stored. In many programs the construction of a suitable grid is a formidable task requiring a considerable investment in time and effort. Most programs typically use one or more types of polyhedral elements that must be connected to one another as well as conform to the geometry of a flow region. For complex flow regions it is often necessary to use unstructured grids or separate blocks of regularly connected elements. Even when automatic grid generators are employed there are requirements for users to supply data to control the number and type of elements, their connectivity, aspect ratios, and other features. In general, the generation of a geometry conforming grid can consume a significant amount of time and effort. In addition to generation difficulties, grids made from polyhedral elements may possess limitations because element faces must match up and elements must not be too distorted (which can be a problem when flow regions have rapidly changing cross sections). Most importantly, geometry conforming grids must be regenerated whenever a change is made in the geometry. In free gridding the operations of geometry building and grid generation are independent of one another. Changes in either the grid or geometry can be made freely without requiring changes in the other. The free gridding method used in FLOW-3D consists of a simple rectangular mesh with variable spacing controlled by a few parameters. Solid geometry (either constructed from primitives with the program’s preprocessor or imported from a CAD program) is then placed in the grid using the Fractional Area Volume Obstacle Representation (FAVOR™) method. In this technique, which is unique to FLOW-3D, those portions of element surfaces and volumes blocked by obstacles are computed and stored. The computations are done entirely by the preprocessor and require no user interaction. 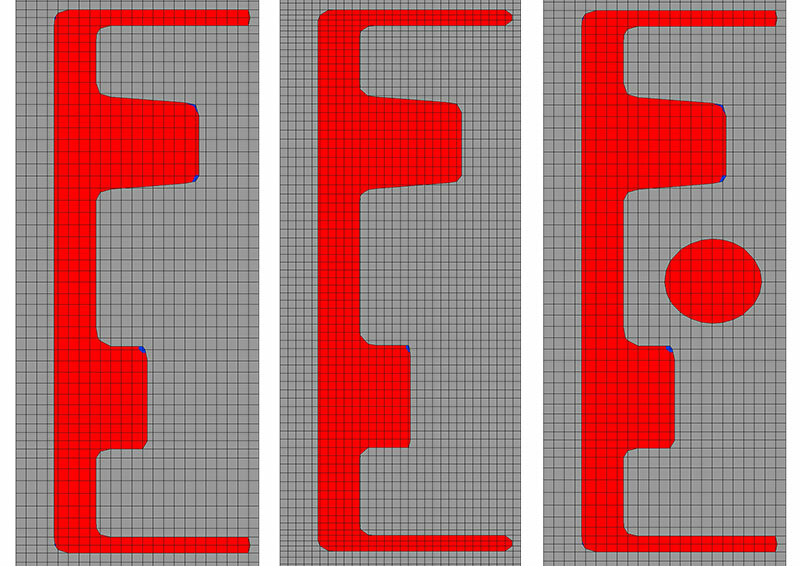 Because grid and obstacle construction are decoupled, free gridding allows users to modify geometries without changing the grid. Conversely, grid refinement or other changes can be made without affecting the geometric model. This freedom means that complicated geometries described by CAD files can be gridded and ready for solution in a couple of hours, even allowing for a few iterations to get the desired level of local grid resolution. An example of the free gridding technique used in FLOW-3D should make clear the advantages offered by this approach for CFD analysis. Figure 1 (left) shows a rather coarse grid developed for the study of flow into a dumbbell shaped cavity. The same geometry with a refined grid is shown in the middle. With FAVOR™ this change is made automatically by the preprocessor when the user changes the number of cells specified in the horizontal and the vertical directions. Decoupling the grid generation from geometry permits changes to the geometry without remeshing (right image). FAVOR™ makes the changes in a matter of seconds, freeing the user from the complexities of conforming grids.